Earnest Walker came in contact with music as a young kid meeting the Wooten family, whose house was continuously filled with the sounds of live music. It was not the bass player Victor Wooten but his brother Rudy who inspired Earnest with his saxophone. Starting playing guitar he decided soon that the saxophone is his principle instrument. Smooth jazz and saxophone is a nearly a synonym. It's a hard job to succeed in music business and especially in this genre where one can found so many professional instrumentalists. But I really believe that Earnest Walker Jr. can win the race. After "Raindrops In The Sun" (1998) this album is his second effort to gain the attention of record labels. The entire album was mixed and mastered by the one and only Tracy "Rum" Nelson of Philadelphia. "I first played with Tracy at the prestigious club 'A Brave New World' in Philly and we have been friends ever since," Earnest recalls, "When I told Tracy that I was working on a new project he was adamant about being heavily involved". The album starts with Welcome To The Party, a sound collage. Sweetest Things is a smooth mélange of soulful vocals and Earnest Walker's sultry saxophone. Tracy Nelson composed this awesome tune and also added keyboards and drums. The title P-Cola Bounce is Earnest's "thank you" to his fans from his hometown Pensacola, Florida. Growing up in Pensacola many of us affectionately nicknamed the city 'P-Cola'", Earnest states, "I do my best to perform there when ever I can get a chance. While there in 2005 the DJ of the club struck up a Marcus Miller song during our break called 'Bruce Lee'. Man, you have never seen a group of people get into a song they way they grooved to this one. This was uniquely Pensacola, people there don't care what's on the radio or what's 'popular'. They like what they like. When I head the kickin Gerald Albright alto solo on this song, 'P-Cola Bounce' flowed into fruition." Earnest Walker is playing all instruments, composed and arranged this tune. He knows the groove indeed. The fourth track Mysterious Kiss is the first of two written by renowned composer Richard "Tuck" Tucker of Rich Boy Productions (tm). Tuck is a writer and guitar player for Kindred The Family Soul and has a host of production credits to his name. "I also first met Tuck at 'A Brave New World' and went on to play with him at some venues in New York." says Earnest, "In September 2005 Tuck, along with good friends of mine Timmy Hudson (drums) and Stacey McGee (bass) came down to Miami on tour with Kindred The Family Soul. We cruised South Beach and had a great time. I joked with Tuck, 'if you don't write me a song for my next CD I am going to not take you back to the hotel but drop you off in the middle of Miami! Apparently this worked because Tuck wrote not one but two songs for the project!" Earnest laughs. That creamy smooth guitar solo heard in the middle of "Mysterious Kiss" showcases one of the many talents of Richard Tucker. Tiera's Dance is a small motif and intermezzo introducing the next piece. Richard Tucker's Cruisin Down Broad Street is a song with a strong hip hop rhythm. Slow and intense, this tune is spreading a positive mood. Knocking At Your Door is another slow tune showcasing Earnest skills especially in playing sax and keyboards. It's a good opportunity to compare a new talent with other artists when he is playing covers. Between The Sheets was a huge hit of the Isley Brothers in 1983. This sing is very popular and was interpreted by Fourplay, Marion Meadows, Joe Johnson, Kim Waters and many more. Earnest Walker sets his own accent. Move Forward is a funky approach with a consistent rhythm. Key West, South Florida is an interesting place for a short visit or a longer stay. The town with ancient wooden houses is often visited by myriads of tourists. Earnest Walker reminds at this place with his interplay Key West Sunset. Bryan Parr, Bryan Williams and Andre Webster are band mates of Walker's group "Blind Date". Bryan studied music education for two years at West Chester University and then went on to play guitar and sing background for many major acts like Harold Melvin and The Blue Notes, The Intruders, The Chi-Lites, Billy Pauls,Tony Terry, Pattie Labell, Eddie Holman, The Stylistics and Ray, Goodman & Brown. He also composed the tune Coolest Days. Somehow the Philly Sound shines through. Friends Of the super-group Earth, Wind and Fire will certainly remember their hit That's The Way Of The World. It was their greatest album selling more than 5 million units. This group imprinted in Earnest Walker a type of soul-jazz feeling that has impressed his musical life. So this tune is a homage to EWF, a group with a indisputable influence on a whole generation. The title tune Variations On A Groove isn't following a certain melody but reveals Earnest Walker's enjoyment of improvisation. The snippet I'm Out lights up in an amusing way the problems musician have with their family staying too long in the studio. 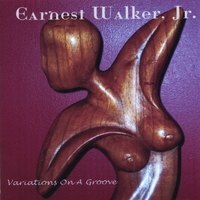 Earnest Walker's second album Variations On A Groove has certainly ups and downs. In its entirety the album has awaked my interest. So two thumbs up for Earnest Walker.